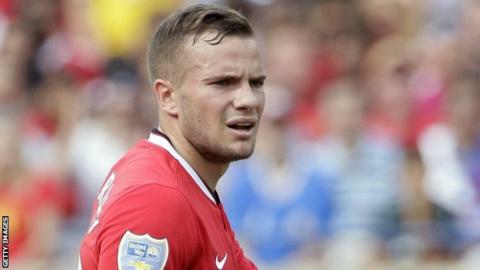 Aston Villa have signed Manchester United midfielder Tom Cleverley on a season-long loan. However, it is understood United have the option to take him back in January, or Villa could complete a full transfer during that window. Cleverley, 25, has 13 England caps although he has not featured for his country since the 1-0 friendly defeat by Germany on 13 November 2013. "Hopefully I can get back in the England team," said Cleverley. "I have got to get back playing," added Cleverley, whose United contract expires in the summer of 2015. "Playing football is what matters most to me and I'm looking forward to getting back to what I know I can do. Villa is the kind of club where I can do that." The deal was struck late on transfer deadline day on Monday and the clubs had been waiting for it to be passed by the Premier League's board. Cleverley came through United's academy system and signed a four-year contract in October 2011 but has played only one of their four games this season. Permanent: Shinji Kagawa, Alexander Buttner, Patrice Evra, Bebe, Jack Barmby, Federico Macheda, Nemanja Vidic, Louis Rowley, Rio Ferdinand, Charni Ekangamene, Danny Welbeck, Tom Lawrence. Loan: Vanja Milinkovic, Angelo Henriquez, Nani, Javier Hernandez, Nick Powell, Michael Keane, Tom Cleverley. United's new manager Louis van Gaal, who is trying to revive a side who recorded their lowest league finish since 1990 last season, is willing to let the midfielder leave Old Trafford. Cleverley, who has made 79 appearances for United, was also linked with a move to Everton. He was on standby for the 2014 World Cup but did not make Roy Hodgson's final 23-man squad. Cleverley has also been omitted from the England squad for Wednesday's friendly against Norway and the Euro 2016 qualifier against Switzerland next Monday.